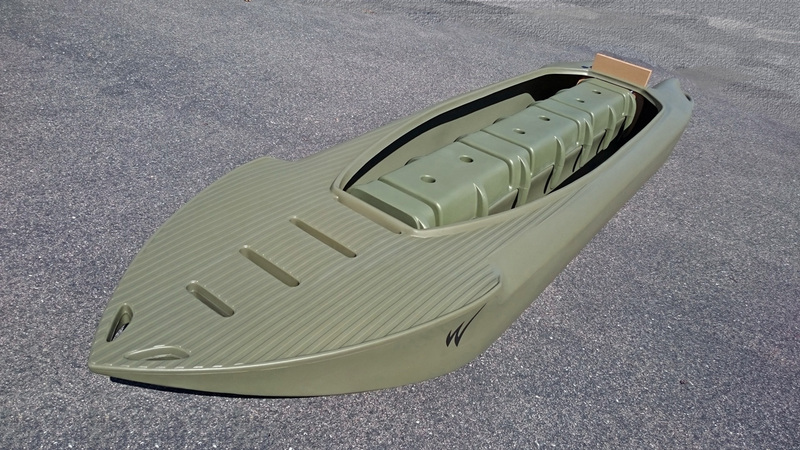 What makes the Wavewalk 500 faster and easier to paddle than other fishing kayaks? Before getting their Wavewalk kayak, many of our clients had tested or owned common fishing kayaks, and they weren’t too happy with the way these kayaks performed with regards to several basic requirements which are essential to paddling. 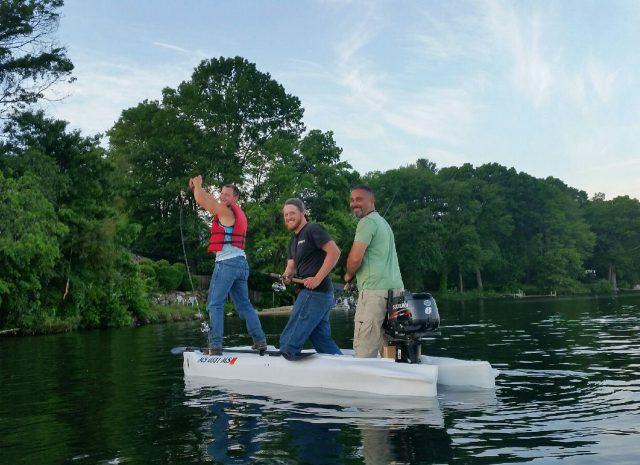 In contrast, the same people find the Wavewalk 500 very easy to paddle and handle. This article explains some of the technical differences between the W500 and all other fishing kayaks, and how these differences work to the advantage of W kayakers. What makes common fishing kayaks special as a class of kayaks? If you walked into a store that sells all kinds of paddle craft (e.g. canoes, touring kayaks, sea kayaks, recreational kayaks) and you looked at at the fishing kayak models side by side with the other kayaks, you’d notice that fishing kayaks look chubbier. In other words, they are wider than the other types of kayaks, and some of them are almost as wide as the big canoes displayed in the store. 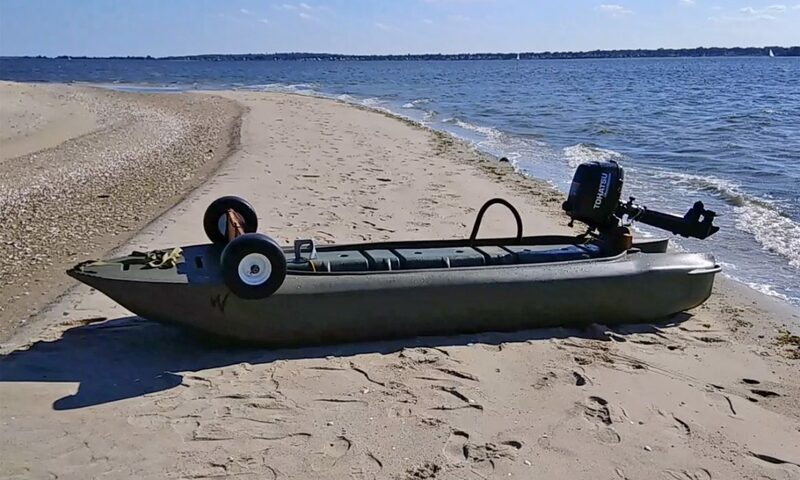 The main reason for this is that fishing kayaks are required to be more stable than other kayaks, and the only way to make a mono-hull kayak stabler is by widening its hull. This gain in stability comes at a price, and you as a paddler pays it by having to paddle harder since your kayak is slower and tracks poorly – It zigzags and responds better to the wind that deflects it from its intended course than to your efforts to go straight forward. For this reason, fishing kayaks have a bad reputation among kayakers, who call them barges, and rightfully so. 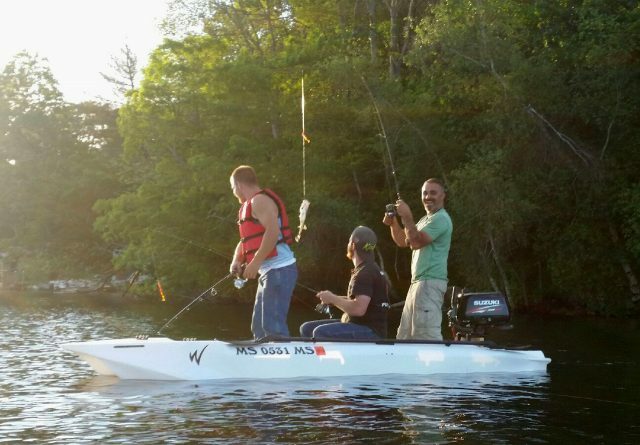 What makes the common fishing kayak design so problematic? 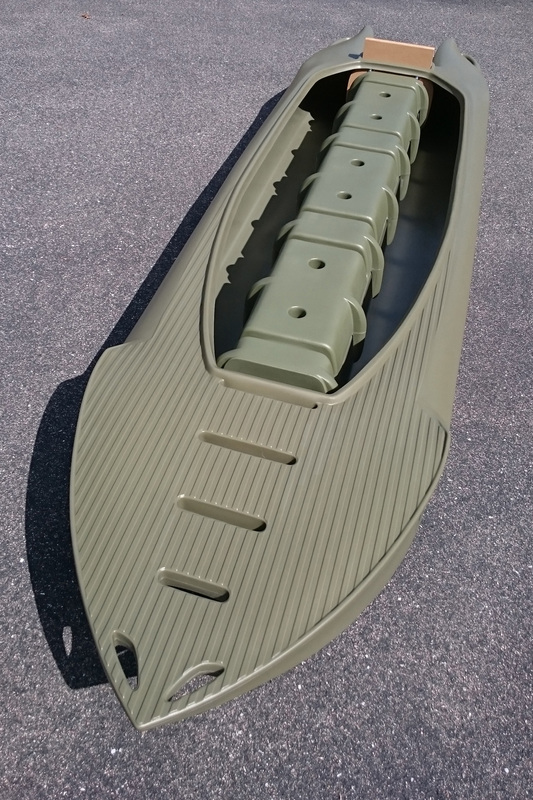 Poor tracking – To begin with, a wide kayak hull compels the low-seated paddler to move their paddle more horizontally than vertically. This drives the paddle blade in a curved trajectory rather than an efficient straight trajectory in parallel to the kayak’s direction on travel. As a result, each paddle stroke changes the kayak’s direction in a way that’s easily noticeable, and the paddler must correct it with a paddle stroke on the kayak’s opposite side, which in its turn would deflect the kayak to the other direction… Such alternation between left and right is known as zigzagging, and it’s a most inefficient way to go forward because it increases the actual length of your route, and on top of this, changing course in itself requires acceleration, which is lossy in energy terms, especially when it’s done repeatedly with every paddle stroke. Poor tracking under wind – This is a special case in which the wind works to deflect the fishing kayak from its course, and since these kayaks neither paddle nor handle well, they become particularly hard to paddle, to a point where getting back to shore may no longer be guaranteed… This difficulty in tracking is why practically every high-end fishing kayak is outfitted with a rudder, which can help the paddler track, but further slows them down – Using a rudder slows the kayak by 10% in average. Low speed – A boat’s speed is closely associated with its hull’s length – The longer the faster. It’s also associate with its hull’s width – the narrower the faster. In hydrodynamic design terms, a hull whose Length to Beam (length to width) ratio is below 6:1 is considered to be slow, and a hull whose L/B ratio is over 20:1 is considered as optimal for speed. Typically, recreational boats’ hulls have a L/B ratio somewhere between the two. a typical sea kayak (fast touring kayak) can be 18 ft long and 24 inches wide. Its L/B ratio of 9:1 makes it fairly quick. a large size fishing kayak that’s 14 ft long and 30 inches wide has a 5.6:1 L/B ratio, which is rather slow. 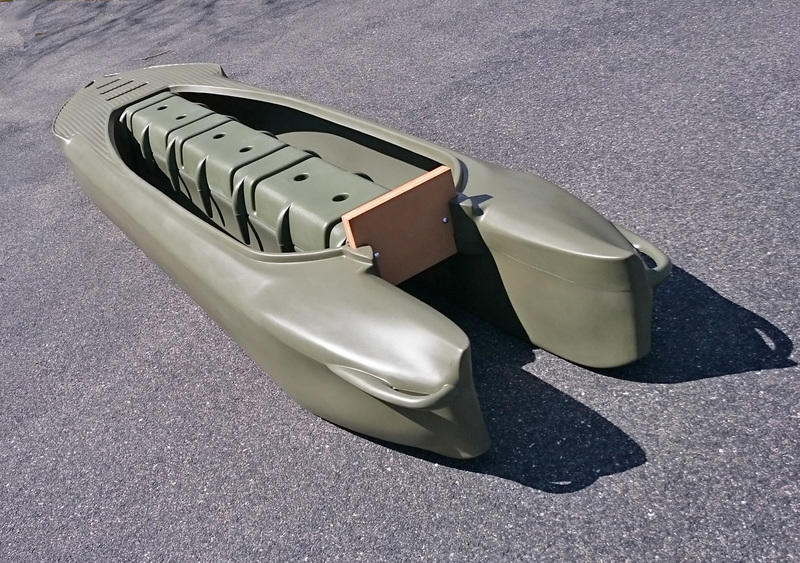 a fishing kayak that’s 12 ft long and 36 inches wide has a 4:1 L/B ratio, which is extremely slow and pretty much impossible to paddle to a long distance. 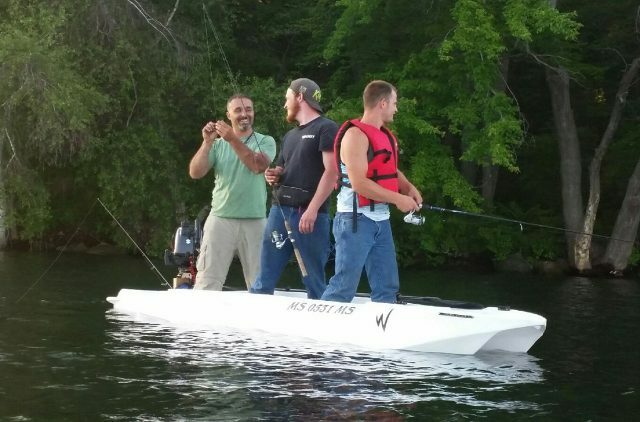 a fishing kayak that’s only 10 ft long and 38.5 inches wide has a 3.1:1 L/B ratio, which could make paddling a stack of plywood easier, if you wanted to try paddling either of these floating objects. In other words, the chubbiest among fishing kayaks are unfit for paddling, unless your plan is to fish in ponds or in small, protected lakes. How does the Wavewalk 500 compare? 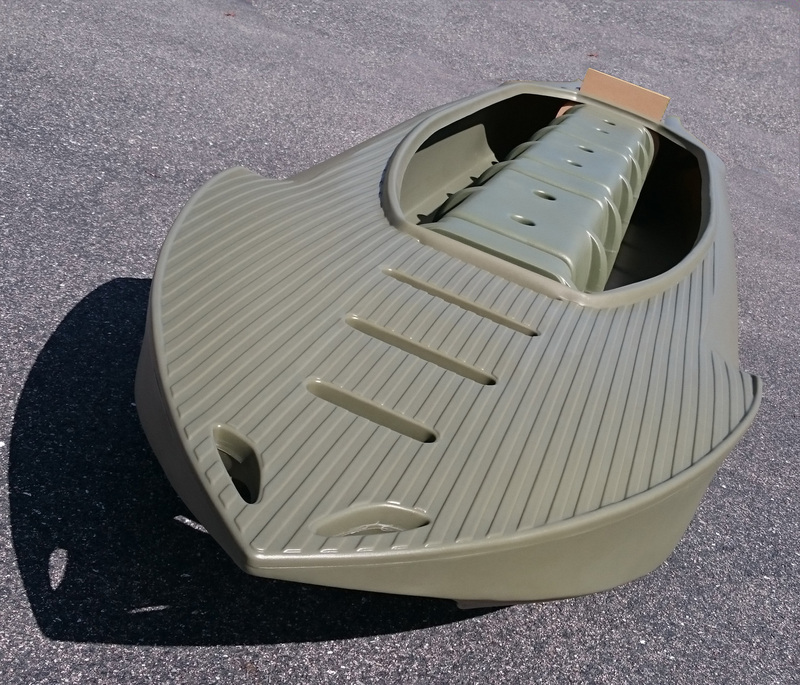 Easy tracking – The W500 is just 29 inches wide, which makes it the world’s narrowest twin hull (a.k.a. catamaran). It also allows the paddler to paddle it from a higher position. The combination of these two attributes makes it easy for the paddler to apply vertical strokes and have the paddle blade travel efficiently in parallel to the kayak’s direction of travel, instead of moving in a curved trajectory. This in itself improves the W kayak’s tracking, but the fact that the paddler rides the saddle in a position that’s more powerful and ergonomic than the L kayaking position offered by other kayaks adds another dimension of efficiency and power to the paddler’s ability to handle their kayak and make it go where the want. Catamarans have a longer wetted length (WL) than mono-hull kayaks of similar size, and this feature makes them track better. In this sense, the W kayak is a catamaran, and indeed it tracks better than any other kayak out there, including sea kayaks that are much longer. In fact, no paddler ever found it necessary to outfit their W kayak with a rudder. Since all mono-hull kayaks offer variations on one paddling position known as the L position, these considerations are not useful for understanding differences between mono-hull fishing kayaks and other types mono-hull kayaks, such as recreational kayak, touring kayaks, etc. In contrast, W kayaks offer several paddling positions, including the Riding position, which is both more powerful and more comfortable than the L position. This offers yet another advantage to the W kayaker, in the sense that they don’t suffer from back pain and leg numbness that are typically associated with traditional kayaking, and for this reason they don’t have to struggle with premature fatigue and discomfort, and thus dispose of more energy to keep paddling even in adverse weather and water conditions. 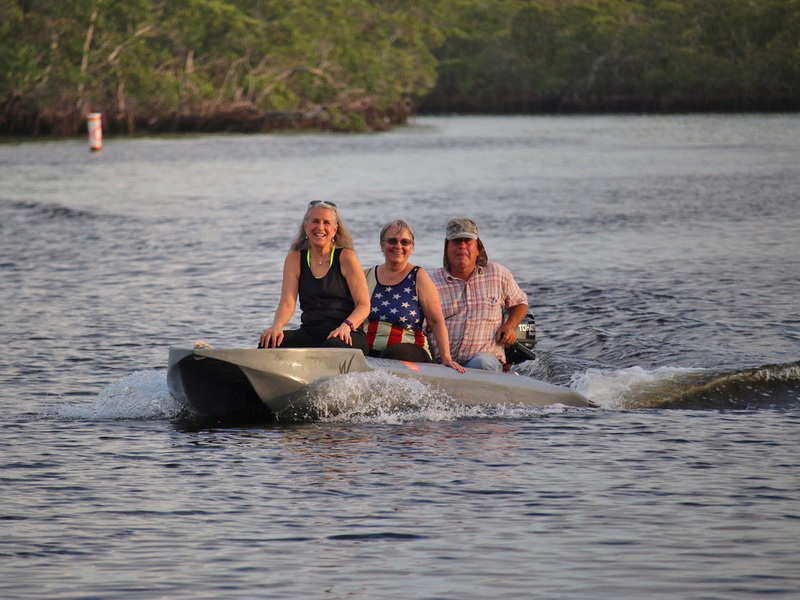 This is why the W kayak is favored by paddlers and anglers who suffer from disabilities, are middle aged or elderly, non-athletic, and by those who don’t benefit from a high level of physical fitness. Indeed, W kayakers can often be seen out there on a river or a lake in poor weather conditions that drive other kayakers back to their homes, or discourage them from going on water to begin with. The fall feed is on in PA, and it creates great fishing opportunities. Here is one of the Smallmouth bass I hooked while on a 10 mile float down the West Branch of the Susquehanna river, in my Wavewalk kayak. I’m not much of a story teller but I stood up most of the time which allowed me to wing a crank bait out and run it through the deep water haunts where the breeders lay. I had no need to stop, cause I could stand to fish and sit down to relax every so often. This is extremely important to me cause I have gone through three back surgeries and I need to be able to stretch out once in a while so I don’t get stiff. There was a stiff cross wind blowing up river which would be a problem with any other kayak, but my Wavewalk tracked straight and true even in the cross wind. Today I took my kayak to lake Massapoag, for a paddling trip. This time, I was able to get it inside my midsize SUV almost all the way in (see picture), which made its transportation even easier than attaching it to the car rack. We had 15-20 mph wind, with gusts over 25 mph. Lake Massapoag is about 1 square mile, which means we had white caps. There were no kayaks, canoes or paddle boards on the lake, except a kayak outfitted with an electric trolling motor whose driver did the smart thing and drove close to the bank where houses and trees offered him some protection from the wind. No fishing boats in sight either, naturally, since you can’t cast under such wind. I launched my kayak at the northern beach, and paddled standing to the other side, taking the short road through the center of the lake. That was pretty easy, considering the wind was blowing generally in my back and my side, and it was so strong that sometimes all I had to do was just stand and steer with my paddle and make sure the waves don’t play a dirty trick on me while I’m taking a free ride. It was fun, and the fact I could track effectively saved me both time and energy. Another important thing worth noting was that being able to switch positions and paddling styles improved the effectiveness of my response to variations in the wind’s direction and force, as well as to the waves that reached 1 ft on several occasions. I’m not in great shape, so I was thankful for being able to make these changes, since it minimized fatigue and prevented me from getting injured. This time I remembered to cover the front part of the cockpit with the cockpit cover, so I stayed bone dry, although the waves were breaking on my kayak, and the wind was pushing spray all over it. Only the top of my head and my face got wet from drops of water that flew from my paddle – I should have worn a hat! I just tossed the kayak in, lowered the rear hatch, and used the strap to attach the door handle to a hook at the bottom. It took me less than a minute. Needless to say that it was easier than attaching the kayak to the car rack. Here’s more info on one aspect of kayaking in strong wind > – tracking and steering. The Kayak Arrived safe and sound about 3 weeks ago, and I am enjoying it a lot. I have taken the kayak out 3 times now. The first time it was very windy and English Bay was pretty rough. I was far too eager to try it out so I put on my life jacket and went for it. The Kayak handled really well and was easy to adapt to. The Waves just off shore move perpendicular to the beach and so I tried catching them on my way to false creek. I never quite managed it but I had a lot of fun. The second trip was a little less rough but still quite wavy. I Traveled across English Bay this time from Kitsilano to West Vancouver when I looked back I was surprised how far away Kits was. I beached for a bit, bought some pizza, took pictures of a Seal and then headed back. The next day I wasn’t sore at all which is bizarre. I assume it was the extra wave action that was responsible the first time.